If anyone designs a "engine" stage for the fuel tank that serves as a dummy payload, you can do a grand tour with this. Damn... Thats a lot of fuel! 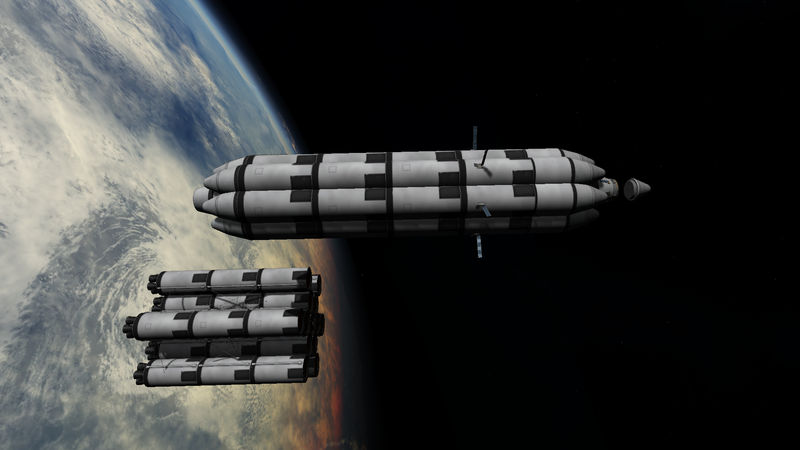 Even if not used for a grand tour that will serve as an excellent orbital fuel depot. Great work mate! Thanks! It took a little while, and I had a lot of difficulties, but I think I can scale this down to create multiple smaller, more efficient rockets as well, or I could scale it up to possible become reusable! Try attaching parachutes to the lower stages. A mostly recoverable 3000 ton lifter! I didn't add nosecones to keep the total weight down, and keep the costs low. AS a result, it takes 34% of it's weight to orbit, and costs 6.7 kerbucks per ton to launch, provided you fit 3000 tons of cargo on there. This is a very incredible craft, that has taken me over a year to complete. I don't think peeps realise just what a feat of engineering this is! Someone has to make this into a huge grand tour vehicle. 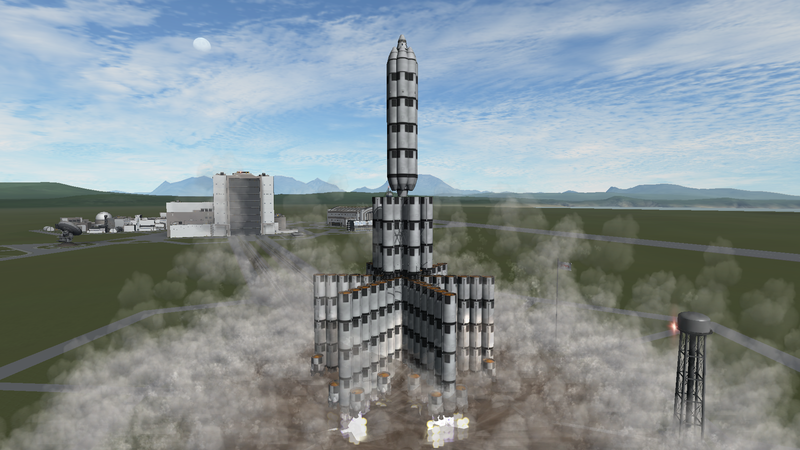 What version of KSP was this designed for? I would agree, I don't think people do much looking into percentage of weight to orbit as a measure of efficiency. Azimech is not correct, it's actually 1.3.0, but i'll see if it works in 1.3.1. I think I have finalized the OP, it states what it needs to, and showcases my rocket well enough now, I'll work on a better "look" for my future craft uploads here, and by better look, I mean I want to make it easy to read and sum up what my stuff is about in a few short bullets. Very nice, but will it work with nosecones? To keep the cost per ton below 7 funds, I didn't add nosecones, but if you want to add them, go ahead! With lifters this large, you don't need to worry much about aerodynamics, because any efforts at increasing it's aerodynamics are lost in the increase in weight and cost of the rocket, forcing you to build it larger, and thus use more engines, which cost lots of $$$. So to keep costs low, and efficiency high, I did not use nosecones. 7kT isn't much, I've already developed one in the WIP section of the forum, I've just been too lazy to post it in it's own thread. Does that rocket melt your computer or what? It's only 648 parts, I have lifters with over 1,700+. 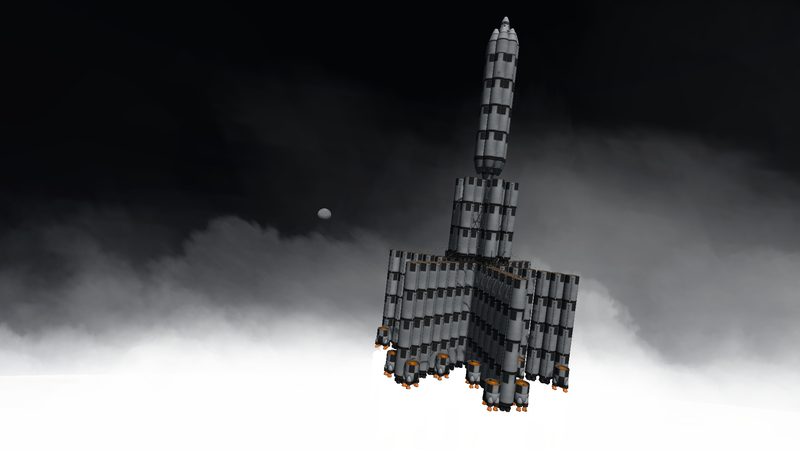 He_162 is the only KSP player with the capability of running craft with 2000 parts, and the patience. Its kinda annoying, really.